Saft -- the (now seemingly defunct as of Safari 5.1) Safari plugin -- had the ability to change the name of the download folder (and create said folder if it didn't already exist) that Safari uses (e.g., by creating a name based on the date). This was incredibly useful for decluttering/ordering my downloads. Is there any comparable feature in a supported Safari extension (for Safari 5.1)? P.S. I know I can create a cron job to do this after the fact, but that seems kludgey and prone to errors because of file timestamps, automatically unpacked ZIP/tar/cpio files, etc. 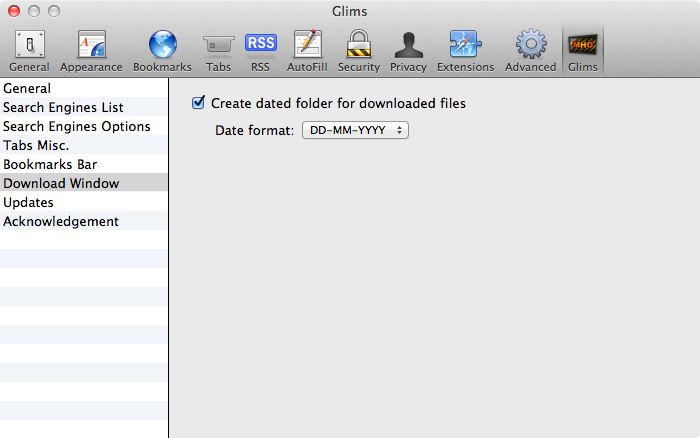 I am using the Glims Safari Plugin (ver1.0b29) in Safari 5.1 (OSX Lion), which has the feature "Create dated folder for downloaded files". I created my own "S/W Downloads" folder and put it in the Dock. I have it show as List, and there is an option to display by date, the newest being on top. If that is sufficient, there is no need for Saft. With the demise of Glims support (beyond Mavericks? ), I broke down and wrote a cron job to automatically change the default download folder of Safari. This seems to work on El Capitan (MacOS 10.11.4) with Safari 9.1. Not the answer you're looking for? Browse other questions tagged safari-extensions safari . How can I automatically start the Safari Reader? Is there a Safari Extension that automatically tracks my daily time usage on Safari? Is there a way to set a different Safari download folder per website? Dynamically change the default browser?